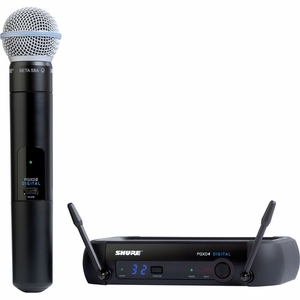 The Shure PGX Digital Series Wireless Microphone System combines the convenience of single touch remote channel setup with the reliability of 24-bit digital operation. Clean RF (Radio Frequency) performance, stable channel operation and low noise are all attributed to the PGX Digital's 24-bit / 48kHz digital operation. The user friendly yet rugged design of the Shure PGX systems measures up to provide years of reliable use in halls, houses-of-worship, clubs, theaters, restaurants, bars, etc. * Dimensions (including SM58 cartridge): 10" x 2" x 2"
* Operating Range: 60 m (200 ft.) under typical conditions. Note: actual range depends on RF signal absorption, reflection and interference. * Operating Temperature Range: -18�C (0�F) to +50�C (+122�F). Note: battery characteristics may limit this range.